First there was the Bloomberg for Mayor cards choking our mailboxes. He doesn't even ask for donations, because he's paying for his entire campaign himself. In theory, this should make Mike Bloomberg an incorruptible mayor. Unfortunately, the general feeling is that the opinions of New Yorkers simply do not matter to him. He has his goals and his philosophy, and he gives off the air of being contemptuous towards the opinions of common folk. The word is out in Jewish neighbourhoods that Bloomberg wants to reach out for the Jewish vote. He has been hiring Jews to get out the Jewish vote since July. The Daily News reported back then as follows. "Here's a "help wanted" flyer being circulated by the Bloomberg campaign in search of "well-spoken, persuasive, confident, and hard-working" field workers to pound the pavement of Brooklyn and Queens to rally the Jewish vote on behalf of the mayor. For some reason, I find the carefully-chosen use of the word "persuasive" amusing. What? Pushy and aggressive is too much? The flyer was forwarded to me by a Jewish reader who noted that it seems kind of early to be hiring paid field. Along with the flyer, there was also an e-mail from Ari Hoffnung, Councilman Simcha Felder's chief of staff, who is doing double duty with the mayor's campaign." From what I hear, Bloomberg has been carefully courting various constituencies in the hope of putting together a winning bloc of voters. Orthodox Jews are one of a number of such focus groups. 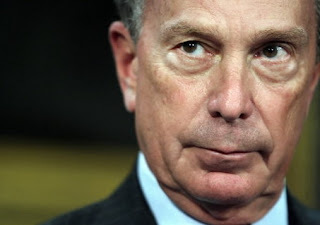 If anyone in City Hall thinks that there is reflexive support for Bloomberg as mayor, they are in for a rude awakening. Bloomberg has a reputation for being very generous to charitable causes. From what I have heard, he has a poor record of answering letters from orthodox Jewish schools and charitable organisations. A friend of mine was at a dinner for a school for autistic children. Mike Bloomberg was a keynote speaker. Instead of speaking of the importance of the school's work, he gave a sermon against Jewish vigilantes taking the law into their own hands. Bloomberg was speaking at a time when Crown Heights had been in the news for the attack of a Jewish volunteer patrol on an African American man. His remarks were totally inappropriate to an audience composed of parents of autistic children. The audience was insulted and alienated. Bloomberg has had eight years to show some sensitivity to orthodox Jews in New York. His game of last minute catch up would not even be necessary if he had showed some interest during the eight years he has been mayor. The various snubs and absences of the mayor are noted and spoken about. he can hire all the campaign workers he can buy and it won't alter his lacklustre record. In a real sense, Bloomberg has united New Yorkers of all races and ethnicities. Skyrocketing water bills, ticket blitzes and steep hikes in the water bills, tax assessments and parking penalties have alienated millions of New Yorkers. When you add in the nanny state taxes on cigarettes and the absurd transfat ban, you have an element of elitism and condescension that rankles many. Wall Street, the fashion industry and other pillars of Gotham's prosperity are certainly important. But there are thousands of small businesses in the four boroughs beyond Manhattan that pay millions in taxes and get very little recognition. I see way too many vacant storefronts. If Mayor Bloomberg could stay on the subway for longer than his usual ceremonial photo op subway ride, he might learn some things about the other side of the Brooklyn Bridge. In eight years, Bloomberg has paid very little attention to the concerns of the outer boroughs. His one accomplishment has been to create a sense of unity among new Yorkers who don't concur with Bloomberg's rosy assessment of life in the Big Apple. I know a lot of orthodox jews who are eagerly awaiting the opportunity in November to make Bill Thompson New York city's second African American mayor. It may be an uphill battle. The three newspapers of New York City, the New York Post, the Daily News and the Times seem eager to treat a Bloomberg third term as something inevitable. Bill Thompson, despite being a Democrat, is nowhere near as well funded as Mike Bloomberg. But New Yorkers can see for themselves the reality behind Mike Bloomberg's glossy mailings. Mike Bloomberg is not just running against Bill Thompson. He is running against Mike Bloomberg. Eight years of aloofness, smugness and condescension has reached critical mass. Whether the papers report on it or not, millions of New Yorkers are waiting to vote in November. Bloomberg has spent $200 million dollars on this election. That is twenty five dollars for each man, woman and child in New York City, trying to convince us that his victory is inevitable. Most of the people I have spoken to are just not impressed. For a guy who's smart enough to be a billionaire, it doesn't seem to be such a great investment.